Icon: the game icon(s) as shown on the desktop. 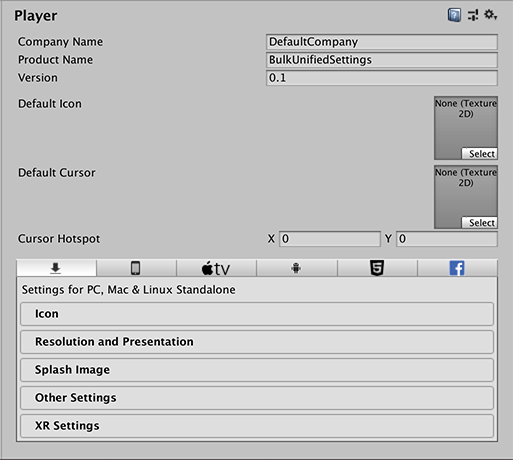 Resolution and Presentation: settings for screen resolution and other presentation details such as whether the game should default to fullscreen mode. Other Settings: any remaining settings specific to the platform. Publishing Settings: details of how the built application is prepared for delivery from the app store or host webpage. See in Glossary Settings: settings specific to Virtual Reality, Augmented Reality, and Mixed Reality applications.